Consistent and Responsive Design: DCS. Client Case Studies. DCS (Data Capture Solutions) provide a wide range of information management software and service solutions for over 400 of the biggest businesses in the world and cover a diverse range of business sectors. Having recently refreshed the look of their brochures DCS felt that the website no longer reflected their current look and feel and also needed to be brought into step with their print media branding. Having looked closely at the new style brochures and company branding and talked extensively with DCS we then identified how best way to proceed in implementing a new complimentary look for the website. In addition being aware of the need to make any new design fully responsive for both smart phones and tablet computing we recommended this as an additional key project objective. Our first step was to create an initial working design, which would allow DCS to see how the new look would work on a number of devices including smart phones. We then worked closely with DCS to refine the final design before it was finally implemented onto the website. DCS were extremely happy with the websites new design and now have a consistent look and feel across all their media channels both on and offline. In addition DCS is now better positioned to take advantage of the up take in smart phone and tablet usage and able to engage effectively with its visitors from multiple devices. 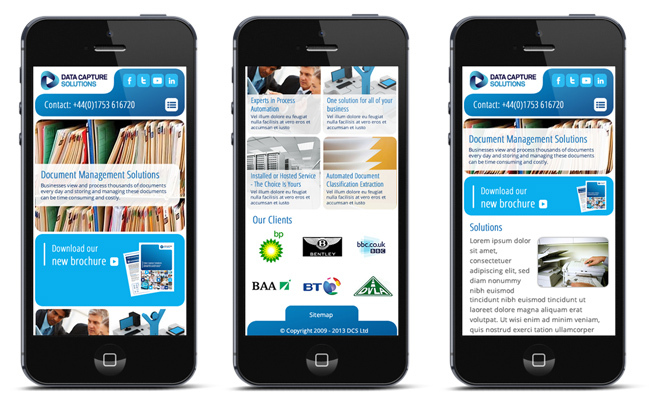 If you would like to talk to someone about website design including responsive design call us now on +44(0)1227 68 68 98.